Mea Maxima Culpa: Silence in the House of God explores the abuse of power in the Catholic Church through the story of four courageous deaf men, who in the first known case of public protest, set out to expose the priest who abused them. Through their case the film follows a cover-up that winds its way from the row houses of Milwaukee, Wisconsin, through the bare ruined choirs of Ireland's churches, all the way to the highest office of the Vatican. Hailed by the critics at the Toronto International Film Festival and the London Film festival (where it won the Grierson Award) Mea Maxima Culpa: Silence in the House of God features the voices of Chris Cooper, Ethan Hawke, Jamey Sheridan and John Slattery. Director Alex Gibney’s previous work includes Oscar winning Taxi to the Dark Side, the Oscar-nominated Enron: The Smartest Guys in the Room; Client 9: The Rise and Fall of Eliot Spitzer; Magic Trip; Freakonomics and Gonzo: The Life and work of Dr Hunter S Thompson. He is currently editing We Steal Secrets: The Story of Wikileaks & Lance Armstrong: The Road Back. Little White Lies had this to say about the film: "Gibney’s most successful and rich work since Taxi To The Dark Side, Mea Maxima Culpa ultimately proves most successful in the way it balances public scandal with a tribute to human frailty and heroism," and Variety called it "A powerful, necessary contribution to a chilling body of reportage that, one senses by film's end, has just begun to take stock of the human costs of a monstrous conspiracy." Our own Jerry Whyte wrote extensively about the film in his London Film Festival article here. 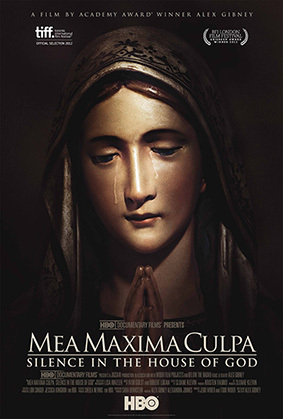 Mea Maxima Culpa: Silence in the House of God will be released in UK cinemas on 15th February 2013 by Element Pictures Distribution.